America is the land of the free and home of the brave because of the sacrifices of those who have served. Our nation must remain eternally grateful for our patriots, especially those who have offered the ultimate sacrifice. Their sacrifices must be reverently remembered as our democracy, freedom, and liberty only exist because of their devotion. America will only be considered great when a fire of patriotism burns within the hearts of its citizens. This fire must burn perpetually through reverence, gratitude, and respect for all who have given their lives for the nation. “We the People,” can only be true to our democratic principles when respect is cultivated in the heart of our nation. This respect must express itself through words and actions, especially at places considered hallowed ground. There are places throughout America that demand reverence without compromise. These sacred places beckon united hearts to forever remember our fallen. In Abraham Lincoln’s first inaugural address on Monday, March 4, 1861, he sought reconciliation for a nation divided. The lesson of Lincoln through his immortal words remains. We must eternally honor every battlefield, patriot, and sacred space that honors them. Every living heart must forever honor our fallen, and reverence must always be exemplified on hallowed ground. These words are one of the first things visitors see when they enter the CIA building, and they must ignite reverence at this hallowed place. These words must also be engraved into the hearts of every American. We must honor all who gave their lives not only at this hallowed ground but on sacred ground throughout the nation. This is the responsibility of our nation and all American’s must honor our fallen. 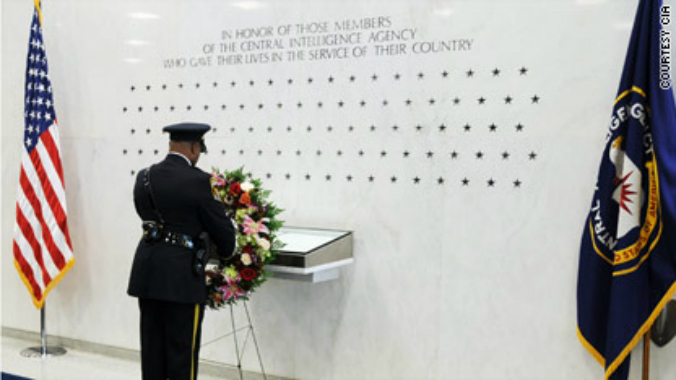 Currently, there are 117 stars on the CIA Memorial Wall. There are 84 stars for CIA members whose identities are known. The remaining stars are for those whose lives must remain a secret, even after death. Each star represents a man or woman who died for America while serving in the field of intelligence. James McCarthy Jr.—a paramilitary operations officer who died in 1954, on a training flight in Southeast Asia. William P. Boteler—killed in the bombing of a restaurant in Cyprus on June 16, 1956. Barbara Robbins—killed in a Vietcong car bomb attack on the U.S. embassy in Saigon, South Vietnam, on March 30, 1965. Nine officers were killed in action during the Vietnam War in South Vietnam or Laos from 1965 to 1975—Unknown (d. 1965), Billy J. Johnson (d. 1968), Wayne J. McNulty (d. 1968), Richard M. Sisk (d. 1968), David L. Konzelman (d. 1971), Raymond L. Seaborg (d. 1972), John Peterson (d. 1972), John W. Kearns (d. 1972), William E. Bennett (d. 1975). Matthew Gannon—one of at least four American intelligence officers aboard Pan Am Flight 103 when a bomb detonated and destroyed the plane over Lockerbie, Scotland on Dec. 21, 1988. Nathan Chapman—the first U.S. soldier killed in combat in the American war in Afghanistan, assigned as a CIA paramilitary team’s communications specialist. He was killed on Jan. 4, 2002, while investigating an Al-Qaeda safe house in Khost. Helge P. Boes—killed by a grenade during a training accident in Afghanistan on Feb. 7, 2003. Major Douglas A. Zembiec—was killed in a gun battle in Baghdad in May 2007, while serving with the CIA’s Special Activities Division. Harold Brown, Elizabeth Hanson, Darren LaBonte, Jennifer Matthews, Dane Paresi, Scott Roberson, Jeremy Wise—killed in the Camp Chapman attack in Afghanistan on December 30, 2009. Glen Doherty and Tyrone Woods—killed during the attack on the U.S. diplomatic mission in Benghazi, Libya, on the night of Sept. 11–12, 2012. Both were former Navy SEALs and worked as CIA security contractors. America must pause and remember all who have fallen serving the nation, especially at our hallowed grounds. We must always exemplify respect, dignity, and reverence at these places, and hold these virtues eternally within our hearts. The CIA Memorial is sacred ground. It must forever inspire reverence, with its stars reflecting our fallen patriots forever shining in the heart of America.